Volvo is launching a new offensive to steal luxury car sales away from the Germans, but the Swedish brand lacks the massive marketing marketing budget of the established players. 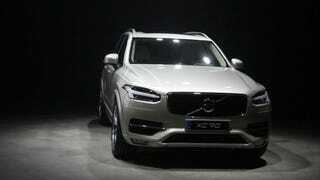 So Volvo is planning on skipping much of the auto show circuit to focus on online sales. For most consumers auto shows provide little in the way of new information especially since most reveals are published all over the web before the car ever appears on stage. The Wall Street Journal reports that Volvo will have limited attendance during the the next auto show season, and will only make appearances in Detroit, Geneva, and Beijing. The brand will shift it's marketing resources to provide an online buying experience similar to what Tesla is offering. Volvo began testing its new online sales effort earlier this year and allowed customers to reserve a limited number of the 2015 XC90 crossover vehicle, which has been redesigned. A total of 1,927 XC90s were offered online. They were all reserved within 47 hours. Not having a display at a major auto show is a risk, especially when your brand is struggling to just to get on the radar of luxury car buyers and this has dealers nervous. Michael Norris, dealer principal at Volvo in Edmonton, Canada said, "You need to experience the car and feel what it is like to drive." Of course for dealerships attending the shows this is an opportunity for them to meet and connected with potential customers. When Volvo Canada backed out of the Toronto Auto Show, some dealers set up their own displays. However, Volvo's sales and marketing chief, Alain Visser believes that a massive overhaul of Volvo's online buying experience will draw more people into the dealerships. The fact is Volvo simply does not have the resources to beat BMW, Mercedes, and Audi at their own game, but with more and more car buyers looking for an online buying experience, this could be the tool that Volvo needs to make it in the U.S. market.